There are plenty of reasons to get excited today. For starters, it's Friday. And the U.S. government is releasing its monthly jobs report, which just might send stocks to new record highs. 1. Jobs, jobs, jobs: The U.S. Bureau of Labor Statistics will post its monthly jobs report at 8:30 a.m. ET. Economists surveyed by CNNMoney project that 233,000 jobs were created in October, and the unemployment level will remain at 5.9%. In September, employers created 248,000 new jobs and the nation's unemployment rate fell below 6% for the first time in six years. "U.S. [jobs] data is the most important data on earth and any kind of extreme reading today could have a significant impact on the markets," said Naeem Aslam, chief market analyst at AvaTrade. 2. Market moves: U.S. stock futures are inching higher in anticipation of a strong jobs report. Gold and oil prices were relatively flat. 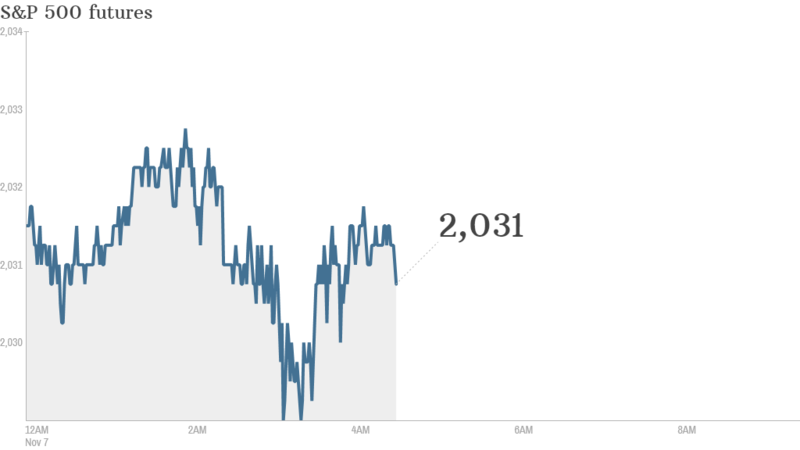 The main U.S. stock market indexes all closed with gains Thursday. The Dow Jones industrial average and S&P 500 rose by about 0.4%, closing at new all-time highs. 3. What's up Warren Buffett? : Berkshire Hathaway (BRKA), the investment company run by famed billionaire Warren Buffett, is slated to report quarterly results after the close of trading. Berkshire has suffered some losses recently on its stakes in Coca-Cola (KO), IBM (IBM) and British grocery chain Tesco (TSCDY). 4. Other earnings -- Disney, Allianz: Shares in Disney (DIS) were falling by about 2% premarket after the firm reported fourth quarter results that beat Wall Street expectations. Much of Disney's success came from Marvel's summer standout "Guardians of the Galaxy" and its "Sleeping Beauty" redux "Maleficent." Shares in Allianz (AZSEY) were surging by 5% in Germany after the company posted upbeat quarterly results and announced a dividend hike. Revenue and profits rose in the third quarter, despite problems at its asset management arm, which includes Pimco. Investors pulled 49.2 billion euros ($61 billion) out of Pimco funds in the quarter, mostly after the founder, Bill Gross, made his abrupt departure from the company. 5. International markets overview: European markets are mostly rising in early trading. The Russian ruble continues to weaken against the U.S. dollar -- trading near record lows -- after the central bank said it would limit its intervention in markets to support the currency.